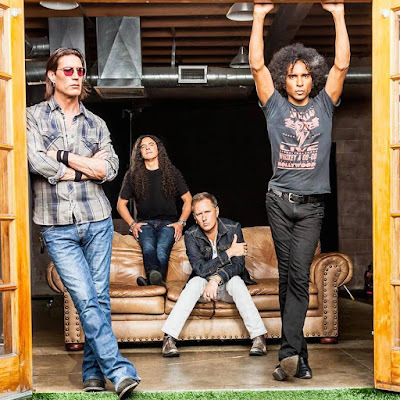 "We are just gearing up to make a record,” Cantrell told Good Celebrity during a recent appearance at the George Lopez Celebrity Golf Classic in Toluca Lake, CA. “We'll be moving up to Seattle in about a month and record the record over the summer out there in the same studio we recorded our third record in. So it'll be kind of fun: go home, make a Seattle record. Hometown boys in a hometown studio." Asked what fans can expect from a new album, Cantrell adds, “Hey, this is what we do. At this age, I can't really do much else. So we do us, and we're lucky enough to be able to have the opportunity to still be doing it and making good music and having a good time." The band’s fifth studio album also marked singer William DuVall’s second with the group - following 2009’s “Black Gives Way To Blue” – since he joined the band in 2006. Directed by Chad Stahelski, the sequel to the 2014 movie “John Wick” stars Keanu Reeves as the legendary hitman forced out of retirement once again by a former associate plotting to seize control of a shadowy international assassins' guild. In theatres now, the project also features Common, Riccardo Scamarcio, Laurence Fishburne, Ruby Rose, Bridget Moynahan, Lance Reddick, Franco Nero, John Leguizamo and Ian McShane. Cantrell performed the song with help from Tyler Bates, who also composed the score for the film.